When the writers strike was in full swing, the networks were hesitant to cancel any of their series, no matter how poor the ratings were. They needed whatever original scripted content they could get. Now, with the strike expected to end tomorrow, the networks have some tough decisions to make. Based on past ratings, which shows should be put back into production? Is it more economically feasible to relaunch an existing show with a big marketing campaign or start from scratch with a new series? Big Shots — The ABC drama received poor reviews and lousy ratings in its post-Grey’s Anatomy timeslot. Of the 13 ordered episodes, only 11 were completed and aired. Bionic Woman — NBC had high hopes for this series but the ratings seemed to drop each week and it’s not a cheap show to produce. Because of the writers strike, only eight episodes were produced and aired. Cane — This CBS drama never caught on despite the star power of veterans like Jimmy Smits, Hector Elizondo, Nestor Carbonell, and Rita Moreno. All 13 produced episodes have aired. There’s a sliver of a chance that it could be back in the fall but USA Today has reported that it’s finished. Carpoolers — ABC’s sitcom has dropped from an audience of nine million to less than four. Of the 13 episodes produced, 11 have aired thus far. The remaining two are still currently on the schedule. 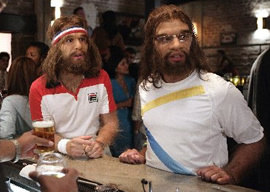 Cavemen — The much-maligned ABC sitcom aired for six episodes. There are seven left on the shelf but it’s pretty certain that the show’s gone for good. K-Ville — The FOX drama’s been off the air since December. One of the 11 produced episodes hasn’t aired. Life is Wild — The CW drama was a ratings disaster on Sunday nights so it’s no surprise that its fate is sealed. All 12 produced episodes have aired. We’ll keep you posted as things change so stay tuned! Bring back My Name is Earl!!!! BRING BACK CANE!!!! That was an awesome show! Watched every episode and couldn’t wait for the next week!! Keep FOX News, and all Chicago Professional Sports. Plus all Denver Bronco, Games. Cancel everything else! Including commercials! I CAN’T BELIEVE CANE GOT CANCELLED!!! This has been the BEST show on in A LONG LONG time. How about some type of petitioning the show was the greatest!! My Mother and I Love the show Cane and couldn’t wait for each episode to air. Finally a show that keeps you coming back and you decide to cancel it. I really hope that you change your minds and give the show one more season. This is awful, everyone at my school is just starting to watch Life is Wild and was actually showed to me during class. My mom also watches it. If this show were to run repeats of the season im betting the ratings would increase, I know alot of people who I’ve shown it to and have wanted to watch more of it.